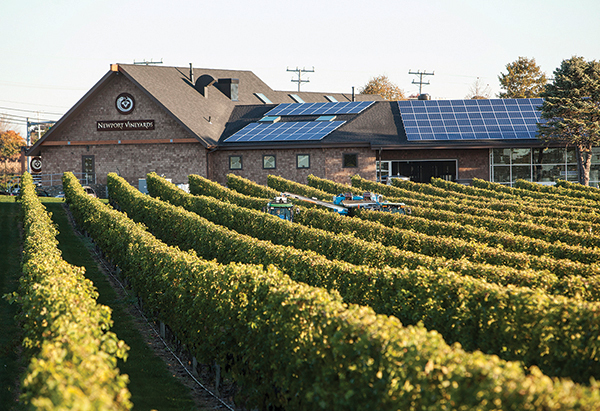 Newport Vineyards recently installed solar panels. Photo by Marianne Lee Photography. We’ve been noticing a lot of solar panels appearing on residential homes across Rhode Island lately. In 2015 alone, $12 million was invested on solar panel installations in Rhode Island. Of the 4.5 megawatts of solar capacity installed in state to date, nearly half is for residential use. Some of our customers have been asking us about the benefits of “going solar” so we put together this overview of some basic information about solar panel installations for Rhode Island residents. A 5 kW system, considered standard for the average residential home, typically costs between $25,000 and $35,000 to install. That’s a lot of dough, but the Solarize Aquidneck program allowed local nearly 400 home and business owners to install solar panels at greatly reduced cost. The goal was to help Aquidneck Islanders save on energy and installation costs, while greening thearea, and promoting energy independence. Solarize Aquidneck sprung froma joint effort between the Aquidneck Island Planning Commission, the town of Middletown, town of Portsmouth, the City of Newport, and the R.I. Office of Energy Resources. What made Solarize Aquidneck so attractive to many homeowners was the fact that, without cost saving programs and credits, solar panel installation can be pretty costly. Aside from Solarize Aquidneck, the state of Rhode Island and the federal government offer significant incentives to make solar installation more attractive and feasible. Rhode Island offers up to $10,000 in grants for new solar installations through the Renewable Energy Fund. Stacked with a federal Solar Investment Tax Credit of 30 percent, it allows residential and commercial owners a 50 percent savings on the cost of solar installation. The Spring 2016 round of Solarize RI ended on June 26, 2016, for Warwick, Providence, and Warren. But Solarize RI plans to continue this initiative in communities across the state. It’s much needed. At full cost, a system that generates the U.S. monthly average of $75 worth of electricity per month could take quite a while to pay for itself. More than 27 years, if you do the math based on a $25,000 investment. That’s based on the assumption that the solar panels produce 100% of the energy you’re accustomed to using in your home each month. But do they really? Will the panels produce enough energy? The average solar panel produces about 200 watts of electricity at max power, when the sun is shining brightly, and things are running at full steam. But the one-size-fits-most model might not work for you if you have a small roof, for example. You may need more energy efficient panels to maximize your space. There are many, many solar panel manufacturers, and panels come in various shapes and sizes, but research says you really can’t go wrong. Check out what people are saying with consumer ratings on various panels for some good, candid background. Let’s backtrack and assume you go with the standard 200W panels. A typical solar installation might includea 5kW array of solar panels, or roughly 25 panels. This would cover 100% of your energy costs, assuming you draw the U.S. average 5kW of electricity. Your solar company accounts for these variables. They can work with you to determine your best bet for getting the most out of your solar system. Is a solar company different than a traditional electric company? Yes. A solar company is made up of dedicated and trained solar panel installers who will determine your specific needs and see you through the process as quickly, safely, and cost effectively as possible. Here is a list of Rhode Island solar power companies, along with consumer ratings. Even if you are a bit overwhelmed by all of this information, you can walk away having learned one thing: solar panel installations are becoming increasingly popular and incentives are making them more attractive and practical.